John Beasley, MD, FAAFP, clinical professor of family medicine and community health, is the 2016 recipient of the American Academy of Family Physicians’ (AAFP) highest honor: the Thomas W. Johnson Award for Career Contributions to Family Medicine Education. The award, selected by the AAFP’s Board of Directors, recognizes an individual’s outstanding contributions to family medicine undergraduate, graduate, and continuing education. The AAFP board noted that it’s difficult to do justice to Dr. Beasley’s contributions to family medicine, given the extent and diversity of his interests and experience. 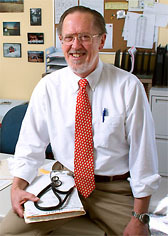 Those include global health; practice-based research networks; rural health, medical education of family physicians and physician assistants (Dr. Beasley is the medical director of the UW-Madison PA Program); and the Improving Primary Care Through Industrial and Systems Engineering (I-PrACTISE) initiative. One of Dr. Beasley’s most significant legacies is the Advanced Life Support in Obstetrics (ALSO®) course that he developed in 1991 with James Damos, MD, the founder of the DFMCH’s Baraboo Rural Training Track. This training program, bought by AAFP in 1993, has since reached more than 80,000 maternity care providers in the U.S. and approximately 75,000 providers in 54 countries—saving countless lives in this country and abroad. “Your remarkable ability to identify and lead emerging trends in family medicine keeps you at the forefront of developing research and educational programs to address the changing realities of the specialty,” wrote AAFP President Wanda D. Filer, MD, MBA, FAAFP, in Dr. Beasley’s award letter. “The Board commends you for your lifetime contribution to medical education; your innovative thinking, teaching, and research; and the profound influence your leadership has had at the local, state, national, and international levels,” she continued. Dr. Beasley will accept the award at the AAFP’s 2016 Congress of Delegates in Orlando, Florida, on September 21, 2016. Congratulations, Dr. Beasley, on this well-deserved honor!